Great places allow get events to happen. Special events make a town into a community. And Golden has had no shortage of them. Along with these events, much time, energy and money has been spent on other events that either haven't come to fruition or only last a short time. With an ever improving riverfront area, it makes sense to plan facilities to accommodate both day-to-day activities and special, repeatable events. Riverfronts lend themselves to some types of events more than others. Event timing is also a key success factor as successful events often help to smooth out tourism activity. 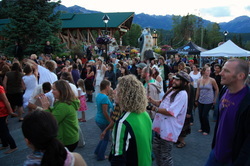 For example, the TELUS World Ski & Snowboard Festival in Whistler is held in April after most other ski resorts have closed; the Banff Fall Festival is after the traditional summer holidays; and Lake Louise's Ice Festival is held in the quiet period after Christmas and before peak winter activity in February. It is critical to ensure that the event leverages the local business community. For example, schedule events when businesses are open (during the day) rather than waiting until they are closed. Here are a few event ideas that may fit in Golden's riverfront and some resources available to plan for their success. Want to start an event or make an existing one better? First, understand the history of the event or activity - talk to those that have been involved in the past. Then, the Alberta Tourism, Parks and Recreation's Festival and Events Planning Manual is a good resource to review next. Golden's physical and natural capital lends itself to sporting events and the Canadian Sport Tourism Alliance is a great starting point, where one can use their resources to evaluate multiple concepts and evaluate a past event's success. However, there are a number of issues that come with hosting more people than civil infrastructure is designed for. Traffic, water, sewer and emergency services are just a few of the possible bottlenecks that need to be known before effort is spent on organizing large events. Positioning one's community as tournament friendly often helps coordinate community groups, local government and hospitality businesses. 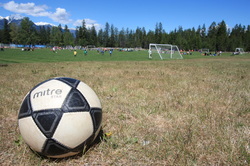 Some communities have tried to become "tournament capitals" of their respective area or province. Kamloops, is considered "Canada's Tournament Capital," while Brantford, ON considers themselves the "Tournament Capital of Ontario." Successful events are supported by both locals and visitors and have a quantifiable economic impact on the host community. For an example of an economic impact study, please see the one below from the Big Valley Jamboree in Alberta, or the estimate from the Mumford & Sons "Gentlemen of the Road" Stopover in Simcoe, ON using Ontario's Ministry of Tourism, Culture & Sport's TREIM. 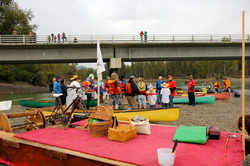 Started in the 1970s, the river battle is named after an old paddle wheeler that use to float up and down the Columbia. The race wasn't held for a number of years, until the Gentlemen's Leisure Club of Golden resurrected the event in on the Sunday of Labour Day weekend in September 2012, where a modest crowd cheered on the participants compared to the event's peak in the 1980s. Beginning on the flats in Nicholson, the race winds up at Confluence Park near across from the Golden Municipal Airport and has a number of categories including: best dressed and fastest boat. Other communities have their own take of homemade craft races on water (Build-A-Boat By The Bay at Bayfest, Port Rowan, ON, sponsored by the local Home Building Centre). 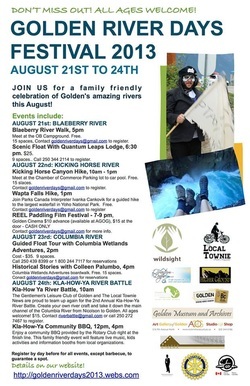 Building on the success of the Kla-How-Ya River Battle's resurrection in 2012, Golden River Days was launched in 2013 and include hiking, canoeing, paddle boarding, rafting, floating, films, food, family & friends. From the success in 2012, the Gentlemen's Leisure Club of Golden grew the River Battle, with the help of more sponsors and partners, into a multi-day event focused on moving water. From gentle to raging water, from wildlife viewing to socializing, and from historic walks to creating new memories, there was something for everyone. The event was enjoyed by all participants and suggests that there is an opportunity to grow and fine-tune the activities, participation and community economic impact over time. 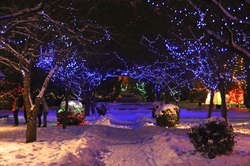 Thousands of lights and themed displays could transform Golden's downtown parks into a winter wonderland. Strategically place exhibits along Golden's riverfront to maximize their view, reflection and beauty. Stroll the parklands at your leisure or step aboard our horse-drawn sleigh available most weekends in December. Motor coach visitors will enjoy the small town hospitality offered to registered group with an official tour. Service clubs both support and benefit from the increased activity. Lights on the first Friday in December until the first Sunday in January each year from 5:30 to 11:00 p.m.
Large music festivals are anchors for many communities across Canada. Each year, they bring in thousands of visitors spending money on tickets, food, drink, accommodations, fuel and retail shopping. A new and particularly interesting festival format has been created by Live Nation and the Gentlemen of the Road. Headlined by Mumford & Sons, their "Stopover" format fits a select few medium-sized and struggling communities. A great synopsis of the impact of this event can be found in Adrienne Arsenault's August 26, 2013 report, The Mumford Effect, for the CBC's The National. 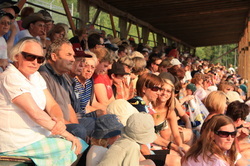 However, these events are only successful through a prudent business plan; seed (and often core) funding; an army of hardworking and committed volunteers; support from the entire community and local government (special event, noise, and parking bylaws); a safe venue near accommodation (including camping) and services; safety and medical personnel and planning; and most importantly, a musical genre niche that is the only place where the majority of enthusiasts can find their favourite bands in a given year or even lifetime. Golden seems to have a continuing interest in hosting these types of festival. Motion Notion is held in July at the Beaverfoot Lodge and the Golden Sound Festival is planned for early September and will be held in Parson, BC. Left: CBC's The National "The Mumford Effect" from August 26, 2013. Centre: An extended CBC News interview with Mumford & Sons. Right: Norfolk Tourism's recap of the entire Gentlemen of the Road Stopover. Keith King Memorial Park is a spectacular area complete with 4 centralized ball diamonds. And while tournaments were quite regular, there has been no activity in recent years. These tournaments require a business plan (with clear metrics and expected returns to the community), a committed volunteer base, longterm scheduling, coordination with local and regional groups and seed support to help start the process. Revelstoke has a long history of hosting a softball tournament, which is being absorbed by a City events coordinator. Art appeals to a very broad portion of the population and more and more people are associating themselves as cultural tourists. While some tourists plan their trip based on attending a specific event, the vast majority of art festival visitors merely happen upon the event. 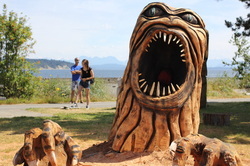 Each summer, in the last week of June, the Campbell River Shoreline Arts Society hosts "Transformations on the Shore" chainsaw carving competition. Artists, amateurs and professionals, are allowed to enter the competition and some are put up by local accommodators. Provided large cedar or fir logs, the artists have days to complete their masterpiece, while the public watches. In the end, the works are judged and some become permanent art installations for their shoreline walking trail. While there may be a finite market for chainsaw carving competitions, this type of event should inspire Golden to look at other events that could incorporate local materials, expertise; placed in a high profile location; and provides a lasting legacy to the community. Closer to Golden, Castlegar hosts a full-time Sculpture Walk, where residents and visitors can vote for their favourite one each season to make it part of the community's permanent outdoor collection. With its rivers and mountains, Golden & Area A is the perfect location for adventure races, comprising hiking, orienteering, mountainbiking and canoeing/kayaking stages. 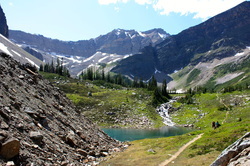 In the past Race the Rockies has been held here, and included Kicking Horse Mountain Resort, Gorman Lake, Forest Service Roads, the Columbia River, Mount 7 and ended in Spirit Square. Other communities without the challenging natural assets like Golden has, have found success in newer Ultra Distance, Spartan, Tough Mudder and Death races. These endurance events also attract teams from across the country or around the world, as well as spectators and support team members, who spend on accommodation, food, fuel, souvenirs and the after-party. The TransRockies Mountain Bike Race and SingleTrack Six, came to Golden in 2014 and has returned regularly. This event is now known locally as the Golden Two Four and starts and ends at Keith King Memorial Park. Beginning in 2015, the Golden Ultra Marathon has become a 3-day anchor event each September. "Mountain bikers are also getting older and McConnell knows they have to accommodate different needs. No longer is the race won by young riders roughing it in the woods. The new race series means mountain bikers could essentially sleep in a hotel and eat in a restaurant every night." - Justin Brisbane, Rocky Mountain Outlook, July 11, 2013. Another, smaller scale event, could resemble Fernie's Raging Elk Powder, Pedal, Paddle Relay, which has been going since 1984. Individuals or teams of 2-5 people ski, bike, paddle and then run in a 18.5km relay race. The race is followed up with events and live music in the ski resort's plaza. Island Lake Lodge sponsor the grand prize - a catskiing package for the winners - which alternates between the top men's and women's teams. There seems to some appetite for this event model as Whistler is reintroducing their Great Snow, Earth and Water Race for GO Fest on May Long Weekend in 2014, after a more than 20 year hiatus. Access to sufficient parking (onsite is desirable, but remote is acceptable). This Festival has not run for a number of years. "This annual wildlife festival celebrates the beginning of spring migration and the end of winter hibernation, with an emphasis on the areas most famous wildlife - birds and bears. The festival features birding and wildlife watching excursions in the Columbia Valley Wetlands and surrounding environs as well as family oriented evening presentations. 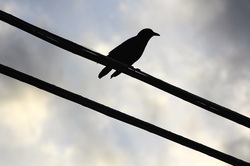 Over 250 species of birds have been recorded in the general area"